Provost and Leader of Inverness and Area re-elected. 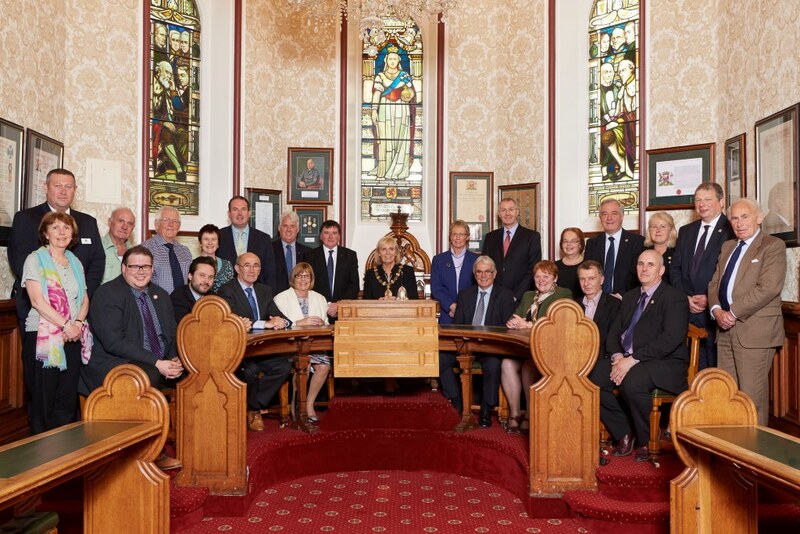 Members of the City of Inverness Area Committee with Provost and Leader of Inverness and Area - Councillor Helen Carmichael (centre seated) flanked by Depute Provost and Leader of Inverness Area Cllr Graham Ross (seated right of Provost) and Depute Provost Cllr Bet McAllister (seated left of Provost). Councillor Helen Carmichael who represents Aird and Loch Ness Ward was re-elected as the Provost and Leader of Inverness and Area today (Monday 19 June 2017). Nominated by Councillor Margaret Davidson, and seconded by Councillor Jimmy Gray; Councillor Carmichael was duly elected at a meeting of the City of Inverness Area Committee held at the Town House, Inverness. As Provost and Leader, Councillor Carmichael will chair the Council’s City of Inverness Area Committee meetings. This is the second time she has been elected to the role of Provost and Leader. Cllr Carmichael’s election to the role of Provost on 25 June in 2015 broke a 600 hundred year tradition of male Provosts holding the role. The earliest reference to a Provost of Inverness was a ‘Provost Junor’ in around 1400. Councillor Helen Carmichael (Independent) – is one of 4 Councillors who represent the Aird and Loch Ness Ward. She was first elected to The Highland Council in a by-election for the Beauly and Strathglass Ward held on Thursday 10 June 2004 and was subsequently re-elected in the 2007, 2012 and 2017 Local Government Elections to serve Aird and Loch Ness. A new post of Depute Provost and Leader of Inverness and Area was approved by the City of Inverness Area Committee and Cllr Graham Ross (Independent) of Inverness West Ward was appointed. He was nominated by Provost and Leader Carmichael and seconded by Cllr Roddy Balfour. Inverness Central Cllr Bet McAllister (Labour) was appointed as Depute Provost. She was nominated by Cllr Jimmy Gray and seconded by Cllr Janet Campbell.